Every collector has heard a journalist musing over the fine line between wear and abuse. I’ll save you that. Straddling the line today we have a reference that has become, at least in my eyes, a bit of an icon. Or perhaps I should say ‘Legend’. 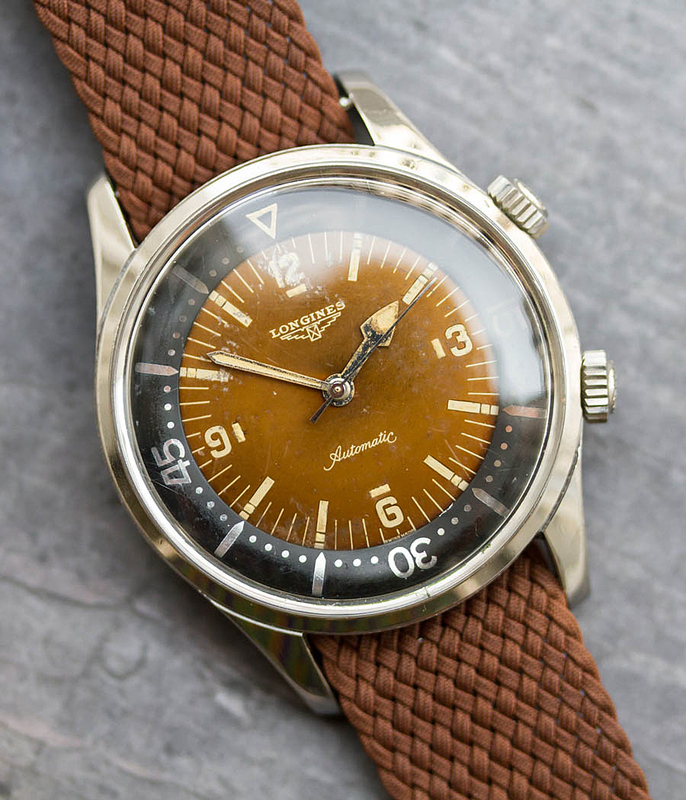 The 7150 was Longines’ initial generation of skin diver, featuring a 42mm Super Compressor case and an automatic cal 290. At 200m water resistance, it was as much a tool watch as anything out of Switzerland at the time. When worn on a simple NATO, it is one of the all-time great understated wrist aesthetics. Longines apparently agrees with me, as they reissued a variation of the 7150 a few years back, under the name Legend Diver. That reference doesn’t even touch the original, as far as I’m concerned. Especially when the original looks like this. This 7150 comes from the German seller World of Time. I’ve never seen one quite like it. The dial has gone full cappuccino in color. Not wanting to be left behind, even the hands have moved towards tropical. Surprisingly though, they haven’t flaked through. At least half of the 7150s I’ve seen for sale have a fraction of their original lume present. Not so here. The contrast which has developed between the main dial and inner bezel is an attractive touch. I’m not sure where the piece was originally sold, but it was definitely in the sun. Certainly, not Germany. The case is not polished or abused. It features one of my all time favorite case backs. All is original as far as my eye can tell, outside of the strap. The cal 290 looks well-cared for. No service history is noted, but no corrosion is visible. Super compressors tend to have very-well insulated movements. I find this patina an asset rather than a detractor. Find it here for 12850 EUR.